It's been eight months since the release of Bioshock Infinite, and now that part 1 of Irrational Games' Burial at Sea content has been released, we're once again thrown into the shoes of Booker Dewitt. So let's dive a little deeper in the City of Rapture and discover the many secrets that await us within our favourite deep sea metropolis. Being the first episode of an ongoing extension to the series, little is explained within episode 1's plotline, but much like Bioshock Infinite, Burial at Sea has you forever surrounded by mystery and intrigue as the words of a darker, huskier, 1950's inspired Elizabeth, help to guide you through the depths of one of the most iconic locations within the gaming universe. As to be expected, curiosity is your main motivation for moving forward throughout this adventure, and aside from gatecrashing the party of a madman, you'll find yourselves learning more about the production of Little Sister's and just how exactly the general public perceive the iconic Big Daddies. That is of course before your primary goal, which is to find and rescue your assumed daughter before any splicer can get there first. Lasting little over 3 hours, the return to Rapture is both warming and nostalgic, but ending with such an ambiguous anti-climax you're left wanting more, yet knowing even less about the overarching story than you did when you first began. Needless to say, all fingers once again point to Comstock and the never-ending loop of suffering he once caused. 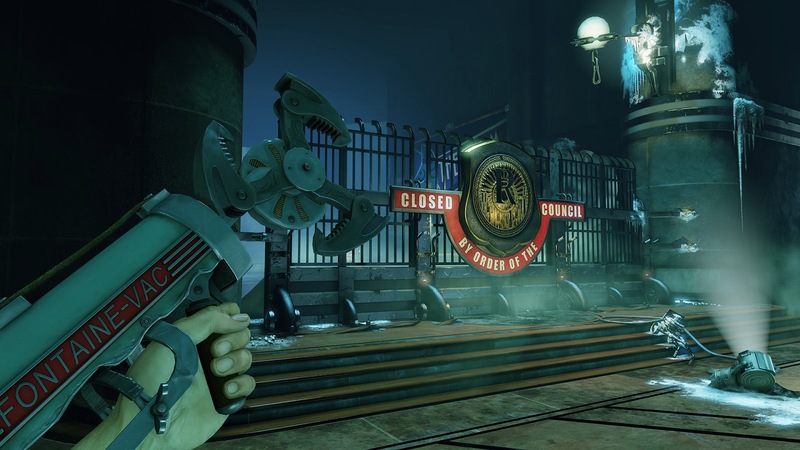 Almost identical to Infinite's gameplay, the action feels fast and rewarding, but with the inclusion of the Skyhook and rails which at times look out of place, Rapture isn't what it used to be and neither is the gameplay. As a nod to the original Bioshock, the Vigors are very similar to the better known Plasmid's within the series, re-acquainting you with both the electrical and ice powers you once grew to love, only now you're able to utilise them as tools to progress further through the title, when all the while you're free to mix up melee attacks, firearms and Vigor Powers to add a little creativity to your sadistic play styles. Old man winter is effectively your Winter Blast Plasmid from the original two Bioshock titles and aside from granting you the power to freeze and then shatter your enemies, you can also freeze over/electrocute flooded floors and create bridges to progress and better explore each new area. Its closed... that's all I got. Infinite's "Gear" also makes a return, as do upgrades via Vending Machines made readily available to you in most areas. Two of which allow you to deal double damage at three times the range with all melee attacks (at the expense of your shield), and randomly add/change the elemental effects of the weapons you fire in combat. Graphically, Burial at Sea has a slight Noir feel to it. Decor and apparel all seem to fit well within the fifties setting and the steampunk edge intertwines well. Elizabeth's new look is also a welcomed addition to the series, but the issue here is that most fans of the series have seen this before. 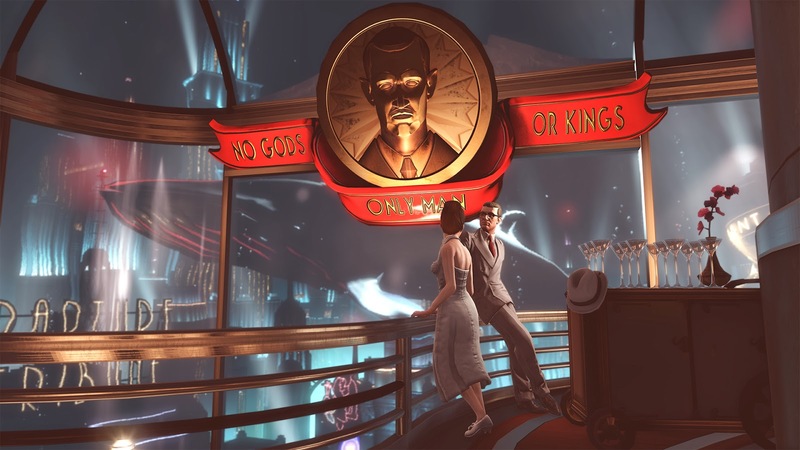 As such, what's left is something that's very nice to look at, but after already experiencing level and costume design far more imaginative in the first two Bioshock titles, I feel that Rapture could have done with a little more work on the design front, because it just doesn't have that same "Wow!" factor of previous titles. Well someone just suddenly turned badass. The sound, although mostly without fault, could have done with a stronger, more memorable soundtrack, and the ambience seemed to lack power and impact. Sadly this wasn't the case. 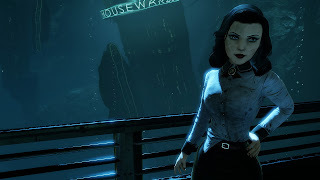 Weapon and Vigor sound effects are pretty much what you'd expect from the series, and although Elizabeth comes across as a much stronger woman with a darker, more assertive attitude that is expressed strongly through Courtnee Draper's voice acting, there isn't a great deal that makes Burial at Sea stand apart from any of the previous titles within the series. With corridors and other such environmental set pieces darker in design than that of Bioshock Infinite's, the underwater City of Rapture is a nice departure from the sunny skies of Columbus, but with the same almost penalty-less deaths from Dewitt's first outting, wider corridors and the accompaniment of Elizabeth, Rapture doesn't feel like the lonely, cramped and suspense-ridden nightmare that it once did, and as such feels more like a warming nod to the titles that were, but sadly offers nothing new to an otherwise great but aging series. Ultimately, whether you're a long term fan of the series or someone new to Bioshock, Burial at Sea is worth playing but isn't likely to impress you to the same degree the first two titles did/will. Saying that, this is only episode 1 and the ending is one that'll make you curious enough to want more.